More and more people are choosing to install their key safe in the letter box. The traditional wall key safes do not suite every need, and with most swiss properties having a large milk box, installing a letter box keysafe is a good solution. Most home care companies require a key safe to be fitted and this solution is often the easiest in these circumstances. This is a question we are asked from time to time when customers forget the code they have chosen for their keysafe. The answer is always the same .... There is no override or reset code for any of the models we sell. In my own personal experience many years ago, it is only when you forget your code that you truly appreciate how secureyour keys are and how difficult it is to try to open the safe by force ! Even with hammers, large screwdrivers and other tools breaking in requires a lot of time and effort .... opening a key box without the code is not at all easy even with heavy tools ! One of the reasons for the popularity of the key box is that it is a simple mechanical device, which requires no maintenance, no batteries and no power supply. Once you have installed and set the code, the owner is in complete control over its use. It is very important that only the owner can give the code to people he or she wants to have access to the contents. If a secret code existed that bypassed the lock mechanism, then the contents would be available to anyone who knew this code. We do recommend that you make a note of the code you set .... just in case you do forget it. There are several different types of Key box. These are by far the most popular variant. To install any of the wall mounted Key boxes you will need 4 screws (usually supplied) which are adapted to the surface on which it is to be installed. The screws are only visible when the Key box is opened, this they can not be touched when closed. These attach to a rail or anywhere that a normal padlock can be attached. The padlock mechanism can only be opened when the box is open, thus maintaining security. Usually these attach directly to a metal surface by using very strong magnets. The magnetic Key box also comes with a seperate small metal plate which can be fixed with adhesive pads to non metallic surfaces. The keysafe auto is a very stury wall mounted model specially adapted for installation onto a car window (or the window of any vehicle). It is therefore as secure as the wall mounted models. With its solid metal body, four wheel combination lock and discrete design, the Keysafe Auto itself is a good quality, wall mounted Keysafe that would be suitable for all installations. 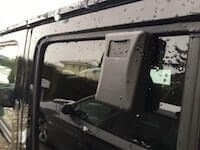 The difference between the Keysafe auto and other wall mounted models is its unique, metal fixing which is designed to attach to a car window. Using two of the fixing holes in the back of the carcass which are usually used to fix to a wall, the vehicle fixing kit securely attaches to the metal body. Once fitted the Keysafe Auto can be installed on any car window within seconds and, once the window is closed, it is firmly attached. I have used the Keysafe Auto myself for well over a year now. I have found it extremely useful both for leaving the keys in situ while undertaking activities on the lakes or rivers, and on trips with the family so that others can gain access to the keys held in the Keysafe when needed. One unexpected benefit of using the Keysafe Auto occured in summer when we used the Keysafe to store the keys to the mobile home .... effectively we had a portable keysafe that we could all use which was especially useful when the children returned earlier than expect from the kids club and we were still out on a bike tour. Is a full cover better for a key safe ? The key safes with combination mechanisms based on wheels generally have small doors to protect the wheels, while push button models tend to have full size covers. In moderate climates or for installations where the key safe is protected from the weather, then the difference is negligable. The full cover has a significant advantage when the keysafe is installed on an exposed wall, especially where there are cold temperatures. Rain falling on the safe could later freeze causing problems if the rain entered into the mechanism or froze the door closed.. A full cover offers better protection and is recommended for installations exposed to rain and freezing temperatures. 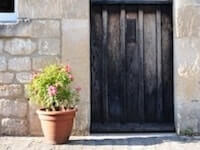 A recent UK survey reveals that the most popular place to leave a spare key remains under the flower pot. Unbelievably even today 19% of home owners still hide the keys to their home under a flower pot ... with no protection at all ! Approximately one out of every 3 Britons admit to hiding a spare key hidden on their property for use in emergency by family or friends. Most bulglaries happen to houses considered easy targets and any house with a key held in this manner is giving a theif easy access to your home. Incredibly, In 2014 alone more than 6,000 uk homes were burglared using a key hidden in the garden. This key safe auto has been created specifically to safely keep your car keys. Stop hiding your keys under the car or on one of the wheels; with this new key safe, simply attach the safe to the car window, close the window and store your keys safely inside. A perfect present for anyone who has a car ! Put your car keys in the safe when you park the car .... no more worring about the possibility of losing them or the risk of them becoming wet by falling in the lake !! All keysafes are designed to cope with all weather conditions, but given a harsh climate such as you find in the Alps, then some models are more adapted to Snow and freezing rain then others. If your keysafe is installed in a sheltered position (in a carport etc) then all of our keysafes are sufficient for your needs. 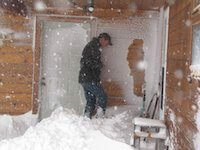 If your keysafe is installed in an exposed position, however, then you muct consider that snow and rain may freeze on the keysafe. If you plan such an installation then we advise that you choose one with a complete cover such as the GE500, the Supra S5 or the Burton KeyGuard. The management of house keys is often a difficult problem for children. They never seem to have their house key with them when they need it or the keys become lost. Whatever the cause when children are alone and unable to enter their home, we as parents have to quickly resolve of the problem. 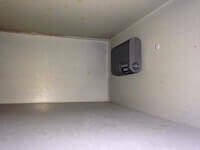 A key safe at the property is a simple, inexpensive way to resolve the problem. 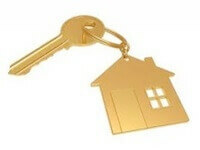 A key safe ensures that a key is always available at the property when it is needed. Over the past few years our home care customers have shared with us the problems they had managing the keys to their clients homes. These companies have found that by having a keysafe installed at their clients home, the keys are always available where they are needed, when they are needed and most of their problems concerning key management disappear. - They company no longer need to store and manage keys centrally, saving time and costs. - The risk of losing or misplacing keys is vastly reduced. - Last minute alterations to staff schedules are much easier as keys are not passed around. - Day to day organisation around the office is made easier. In sumnmary - for every company the cost and risk of managing customer keys and the associated admin is vastly reduced. Designed by the leading American manufacturer Kidde (formerly Supra), the magnetic key safe is designed to be used on those occasions when fixing a traditional key safe using screws isn't possible. The Magnetic key safe has a user changeable 3 digit combination, and a very strong magnetic. It also comes with a small metal sheet with a strong adhesive strip which can be used to attach the key safe to non metallic surfaces. Ideally suited for use within the letter box, the magnetic key safe offers a spare key solution when traditional key safes can not be installed. Based in Villars-le-Terroir, a little to the north of Lausanne, keysafe switzerland have been supplying a range of top quality keysafes to family users and business users throughout switzerland for many years. 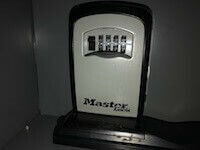 We sell a range of mechanical combination key safes from the worlds leading suppliers including Supra and masterlock. We stock a number of different makes and models to suite all budgets and requirements. We stock a tange of wall mounted, padlock style, magenetic and even a car window mounted keysafe with the vast majority of all models being under 90chf. A Keysafe is a simple, mechanical device designed to keep small objects (usually keys but occassionally access cards or other valuables) in a secure manner, available to those who have the access code. Originally developed by GE/Supra in the USA, it is a small metal box with detachable (or hinged) door at the front which is opened by the input of a code. Most models use two sorts of combination, both mechanical. Push button combinations are used by manufacturers such as Supra and some masterlock models, while wheel combinations are favoured by Yale, Burton, most MasterLock models and others. A key safe allows the owner to set or change the combination code. The access code is generally 4 digits or more and can be easily changed. If, for example, builders are working at a property, you can give them the code to access the key box, then when the work is finished simply change the code to ensure that security is not comprised. Additionally if someone arrives at property unexpectedly, then you can tell them the code over the phone so they can access the contents of the key box. Each keysafe has fixing holes in the back which are accessible only when the key box has been opened. These fixing holes are used to securely fix the metal casing to a solid, flat surface. Usually the casing is attached to a wall or post, but more and morefrequentely people are fixing them to the inside of their post box. - school aged children. Children often lose their house keys or forget to take them with them. With a keysafe on the wall at home, the house keys are always in the right place at the right time and easily accessible even for relatively young children. 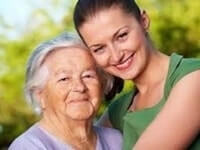 - home help for the elderly : many home help companies now insist that a key box is fitted. This relieves the care company of the responsibility for managing the keys for each property and ensures that the keys are held securely where they need to be. - builder / workmen / Femme de manage : Access can be granted to all of these groups of people without the need to entrust your house keys to them. Once the work has been finished you can easily change the code, thus maintain complete control of who is able to open the key box and therefore who has access to the property. - business premises : Often different people are responsible for opening / closing premises and passing keys between them can be difficult. This solution allows the keys to remain on site in a secure manner. - holiday homes : distributing holiday home keys to guests, family members or people working at the property has always been a problem. With a key safe these problems quickly disappear ... simply install the model of your choice in an appropriate location (choosing a model with a full cover if installed on an exposed wall), set the code and thats it ! When you feel that the code needs to be changed, change it ! A key safe is small, strong, generally metal box which can be mounted on the outside of your house or attached to a railing or car. 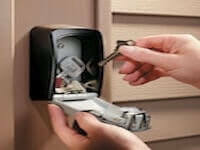 Your keys are securely held inside because the door of the key box is locked using a security code. The keys can be accessed by a carer, family member etc if they have the correct access code. The carcass is generally securely attached to a solid structure such as a wall with long screws. These can only be accessed from within the safe itself, making it nearly impossible to detach from the wall when it is locked. There are many advantages from installing a key management solution at your property, holiday home or business. For home use, you will no longer need to make copies of your keys to give to relatives and carers. This also simplifies acces for the care provider should they need to send a different member of staff to your property then the keys are already in place waiting for them. Also if your care requirements change and you change care provider, simply change the code so that there is no risk of the keys to your house being used by anyone who is not authorised. For business use there are also many benefits especially where keys need to be passed between employees or where a spare on site is a necessary back stop. For holiday home owners not only can guests and family easily access the key once you have given them the code, but also people working on the property can easily be given access as can a cleaner or a neighbour in an emergency. Which model key box should I choose? We stock the Supra C500, which is one of only two police approved key safes in the uk. This model is the most secure available on the market today and has been tested so that it has a security rating as resistant to an attack as your domestic front door. The C500 has a sturdy zinc alloy outer shell, is water and rust resistant, and also has a 12-digit key pad that gives you 479,001,600 possible combinations. The C500 Pro is the most expensive model that we stock but even so we believe it offers outstanding value for money. The C500 is particularly well suited to commercial users and with its full plastic cover this top of the range model is ideal for ski chalets and the like, where snow and ice can be a problem and where the keysafe may be used by a large number of people. As with all the models we stock, the code selected by the owner can be changed quickly and easily whenever it is needed. We also offer the Yale Y500 Key Safe. This model had been developed by the well-known security manufacturers Yale, so you can be sure that it is well made and secure. The Y500 has a four-digit wheel combination and offers reliable security for your home. It has been designed to be fixed to a wall and is the perfect model for customers who require a good quality keysafe but who doesn't need the security level offered by the Supra C500. Our cheapest wall mounted model is the MasterLock Select Access 5401. This model can hold up to five keys and features a weather resistant shutter door which covers the combination wheels and protects them from rain water, dirt and grime. Designed to be mounted on a wall, this model is frequently used within switzerland to attach to the inside of a postbox where wall mounting is not possible. Any of the various models can be fitted to a postbox either by using a strong glue (a two part metal bonding glue will be necessary) of by using nuts and bolts fitted through the fixing holes in the back of the box when opened, but the heavier models (such as the C500 Pro) are less suited to this application. As with the Yale 500 there is a four-digit wheel combination option with a durable zinc outer shell. Yale are one of the biggest door lock manufacturers in the world and have a very trusted brand globally. The yale 500 is the companies first entry into the market and has proven to be a very popular addition to our range of key boxes. 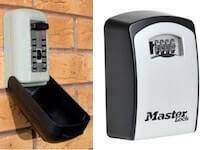 New products : the car keysafe auto, the magnetic keysafe and the keysafe for the mailbox | Keysafe for the postbox With the popularity of the wall mounted keysafe, manufacturers recognised other variations that they could bring to the market. Over the last few years a range of new types of key safe have appeared on the market. The car keysafe auto The car keysafe auto is a standard key box with a specially designed fixing that allows it to be securely installed on to a car window. The car keysafe auto is designed to be installed very quickly and removed very quickly when not in use. The owner simply lowers a car window, hooks the car keysafe auto over the window and closes the window to install the car keysafe auto. 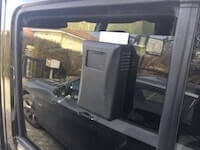 To remove the car key box lower the window, remove the car keysafe auto and store it in the car. The car keysafe auto is suitable for private use or for commercial vehicles. The magnetic keysafe is small, lightweight and has a 3-digit combination. The magnetic keysafe is designed to attached to a metal surface and is particularly well adapted for attaching to a mailbox. For non metallic surfaces, the magnetic keysafe is supplied with a metal plate which can be attached using velcro (or glue) to provide the fixing point. The Postbox key safe | keysafe for the postbox This is another application for the wall keysafe, but uses a strong glue instead of screws to attach it. The Postbox key safe is supplied with a strong adhesive so that it can be securely attached to the inside wall of a mailbox. 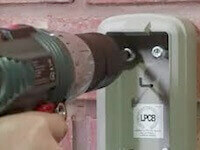 Installing the keysafe for the postbox is simple. No tools are required, simply apply the glue to the rear of the keysafe for the postbox and secure it in place until the glue dries. We offer two post box key safes. The first budget model is the Masterlock 5401. This has a hinged door and a 4 digit wheel combination. The other is the Supra S5. This keysafe for the postbox is mid range. It has a very robust construction, it has a removable door and a push button combination. The door is removed from the postbox to change the code which can be from 1 to 10 digits for increased security. On the market now for a number of years, the postbox key safe for the mailbox is becoming a very popular option for many reasons.